The outfit proposal I'm sharing today is fairly simple. I've taken to wearing hats lately, mostly because the sun here is so strong. Spring sun can be misleading. You may not feel the sun rays as intensely because it is still not that hot, so a gentle breeze might hide its power. I'm sun paranoid like some, but sometimes we do need to protect ourselves from it. Besides applying sunscreen, there are other ways, and wearing a hat is one of my favourite ones. I find that when I wear a hat, I don't feel nearly as tired after wondering around. I first took notice of this in the summer. I don't mind the heat as much if my head is in the shade and a nice hat can see to that. The rest of my outfit is fairly simple. A pair of jeans, a pastel pink purple sweater, a short coat, a blue bag and a pair of biker boots. This could easily be a winter outfit, if it was a warm winter day. Transition between winter and spring is not always dramatic. Sometimes we need to shed our layers slowly. 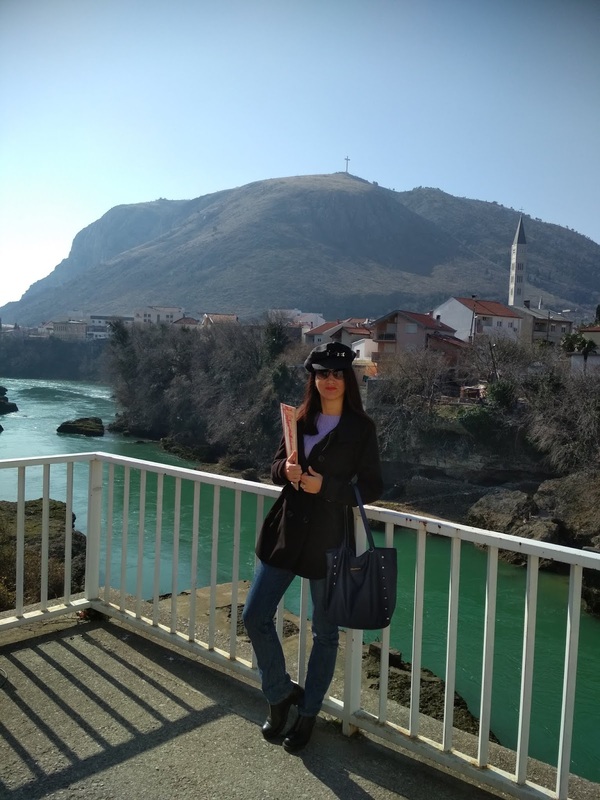 This was a comfy outfit for strolling Mostar city on a sunny day. Alright, to be honest I wasn't so much strolling the Mostar city as I was fighting the red tape. Legally speaking, I'm still an alien in Bosnia and Herzegovina. I don't have a citizenship, just a working permit and an alien ID. I won't bore you much with that, it's a bad situation that I don't like to dwell on. Every place has its advantages and disadvantages. 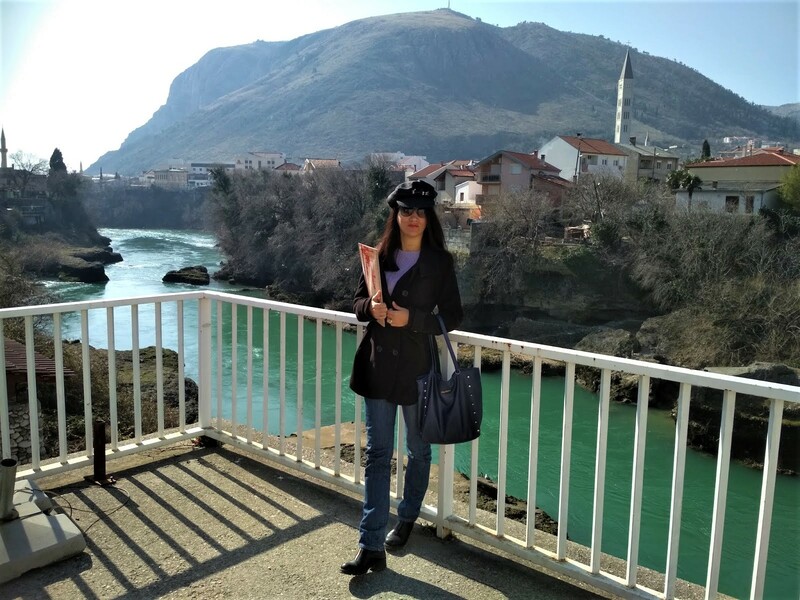 The natural beauty of Bosnia and Herzegovina is absolutely breath-taking. The legal aspect of things? Not that great, at least not for a foreigner who would like to make it a home. This country has one of the most complicated political and legal systems in the world. Nevertheless, dealing with red tape didn't stop me from enjoying this beautiful sunny day, as you can see for yourself. 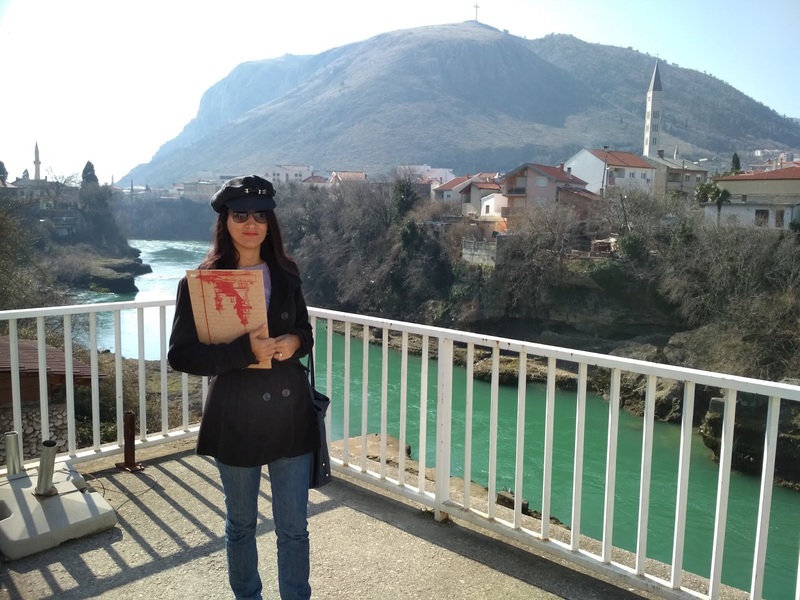 I used it as an opportunity to admire Mostar's beauty. If you're visiting Mostar and looking for great photo locations, feel free visit my post about the most photo worthy locations in Mostar. 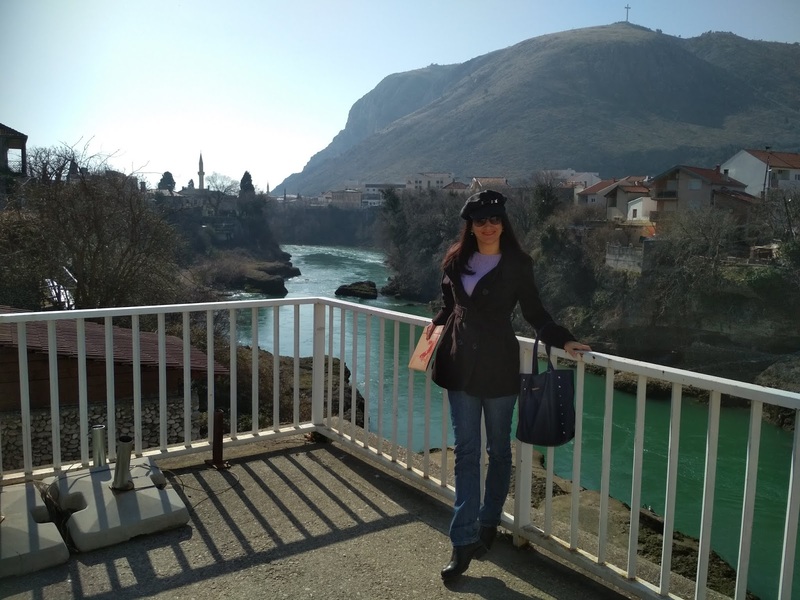 You can check out some of my old posts about Mostar if you're interested in learning more. Bellow is a pretty solid list of old post focusing on Mostar city. 1. You can see Mostar from the bird perspective in my previous posts (here, here and here). 2. One of my favourite streets in Mostar here and here. 4. You can see photographs of Mostar's catholic cathedral here. 5. 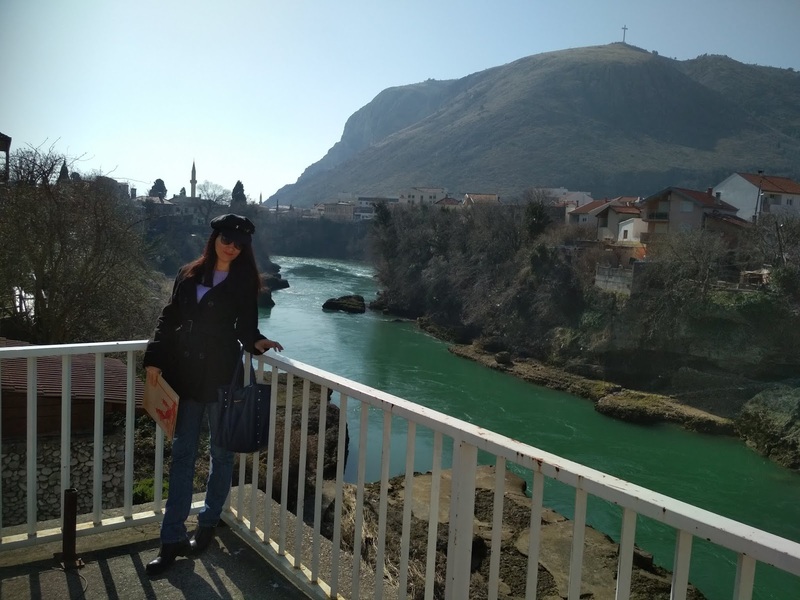 You can see images of Mostar and its famous Nertva river here, here and here. 6. You can see the park area of one of its most iconic catholic churches here. 7. You can see both photographs of old bridge and my drawing of it here. 8. Another one of my favourites when it comes to streets here. 9. You can see photographs of Croatian cultural centre/theater here , here , here , here and here. 10. You can see photographs of the main city park here here, here, here and here. 11. You can see images of Spanish square here, here , here , here and here. 12. You can see photographs of Custom's bridge here and here. 13. You can see photographs of the new bridge here and here. That would be all for today. As always, thank you for reading. and visiting. 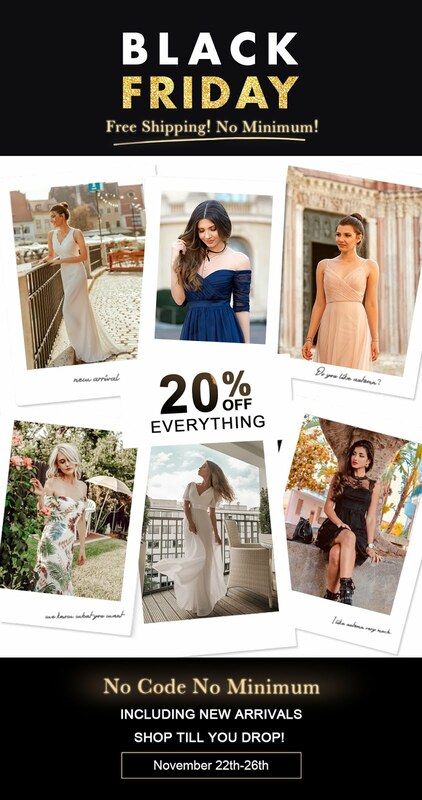 Tell me what kind of early spring outfits you are wearing at the moment. Have a lovely week ahead! This is a lovely early spring outfit! I like the idea of wearing a hat to keep the sun off and the style of the one you're wearing is pretty. Mostar looks really beautiful too! I love that spring is already here! Oooh, it is always nice to hear about towns looking gorgeous with the blooms. I love your outfit! It is simple and it works. Hope the situation in Bosnia and Herzegovina will work out well. Glad you still got to enjoy Mostar! thank you Nancy. I always do enjoy Mostar. What a view! I love your coat and hat together. Your lilac top is a nice nod to spring with the black layers - the coat and hat match so nicely! I'mg lad you enjoyed your day even if you had to battle some red tape! Gorgeous scenery. The color of the water is amazing! Your looks is classic and fun. Perfect! Skin cancer runs on both sides of my family so I know all too well how important it is to protect the skin. thank you Val. Skin cancer is a big issue these days. It runs in one side of my family too. Thank you Vix. I'm afraid there is no hope of sorting it just yet, but at least I have my living permit. Well I bet that is frustrating about being a "foreigner". I think they should read your posts and welcome you with open arms, Ivana. I adore all of your hats. I'm finally wearing them more and more!! Thank you Jodie. You're very kind. I doubt they will read my posts. Considering how much I promoted this country, I should have been awarded a honorary citizenship a dozen of years ago. Questo cappello ti dona tantissimo Ivana, fai bene a indossarli anche per proteggerti dal sole e questo fiume è così bello! Your outfit is cool and perfect for the weather. What you found out when wearing a hat is very true in my opinion as I seldom a long time outside without hat. Thank you Rena. 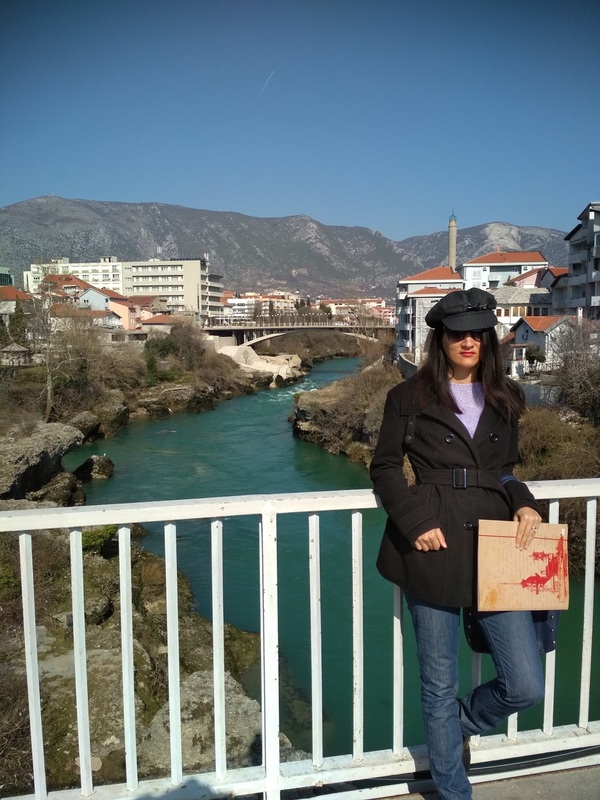 The colour of Neretva always fascinates me to. 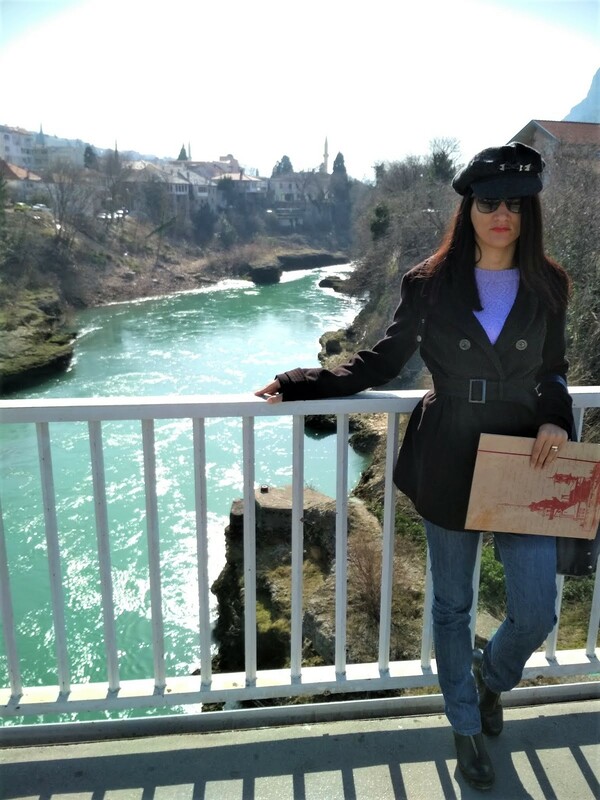 Neretva is also known as the emerald river. Finalmente è primavera e il tuo look è perfetto... mi piace moltissimo! Bellissima anche la vista! thank you Isabella. You're right. Applying sunscreen is really important for protecting our skin. I haven't done so in the past, because when I was younger, it wasn't really a thing, but I make sure to take care of my skin now. I'm so excited for Spring season! And wow the scenery there is so beautiful! It really does look like a beautiful place to visit. And your outfit is perfect for spring when it's important to layer like you said. I haven't actually changed my outfits much yet since it's still really cold here. I'm still dressed in almost the same things I wore in the winter. Thank you Kathrin. It is best to wait for the warmer weather to wear spring outfits. No point in getting a cold for the sake of wearing a spring outfit. thanks, I'm happy you like both the outfit and the scenery. Lovely post dear! You look super cute and comfy! Wearing hats is one of my favorite ways to get a little extra protection from the sun as well. Your outfit is so effortlessly chic. 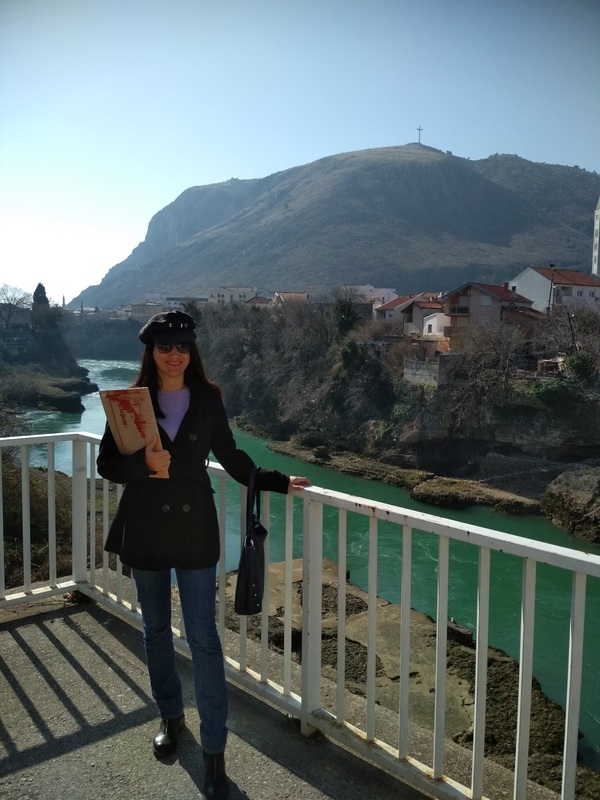 Sorry to hear that you've been dealing with such red tape but at least it didn't stop me from enjoying a beautiful day in Mostar. yes, suns do come in handy when the sun is strong. The place seems to be magical and the photos show that it is very beautiful. You look great in this scenery by the river, and very comfortable in jeans and a lovely and warm coat for sure.